individual variations exist between children with regard to their growth and development (some mature earlier than others) but a first evaluatin at age 7 is a good rule of thumb for most children. When it has been determined that some problems are developing, certain preventive measures may be undertaken to prevent these conditions from worsening.The key to preventin is regular supervision by the orthodontist. Upper removable space maintainer preventing tooth migration and space loss. the use of simple appliances, such as space maintainers, to keep the space available in the dental arches during the eruption of the teeth and prevent worse eruption problems from developing. Inadequate of dental development supervision at age 9: loss of space prevents upper second premolars (arrows) to erupt adequately and causes eruption problemsthat will require an orthodontic intervention. 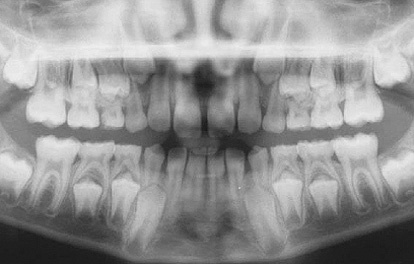 Panoramic radiograph showing a normal eruption pattern for a 9 year old. Proper supervision will insure optimal tooth eruption with less problems. The use of an upper space maintainer allowed adequate eruption of the permanent teeth.